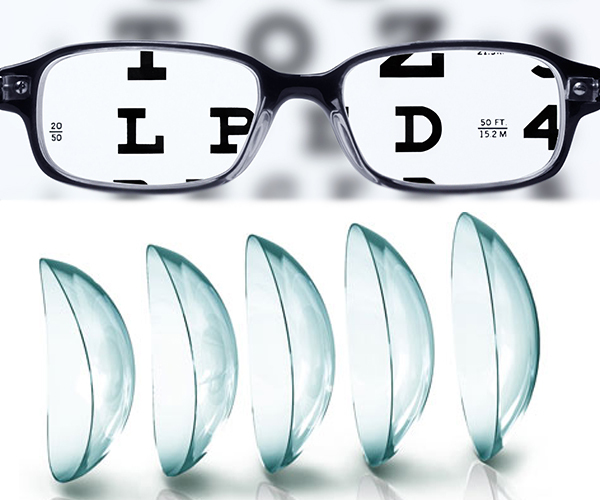 Eyeglasses and contact lenses are devices that correct refractive errors in vision. Eyeglass lenses are mounted in frames worn on the face, sitting mostly on the ears and nose, so that the lenses are positioned in front of the eyes. Contact lenses appear to be worn in direct contact with the cornea, but they actually float on a layer of tears that separates them from the cornea. People allergic to certain plastics should not wear contact lenses or eyeglass frames or lenses manufactured from that type of plastic. People allergic to nickel should not wear Flexon frames. People at risk of being in accidents that might shatter glass lenses should wear plastic lenses, preferably polycarbonate. (Lenses made from polycarbonate, the same type of plastic used for the space shuttle windshield, are about 50 times stronger than other lens materials.) Also, people at risk of receiving electric shock should avoid metal frames. People employed in certain occupations may be prohibited from wearing contact lenses, or may be required to wear safety eyewear over the contact lenses. Some occupations, such as construction or auto repair, may require safety lenses and safety frames. Physicians and employers should be consulted for recommendations.